Can I use Indoor Lighting Fixtures Outdoors? There are hundreds of fixtures available for indoor and outdoor use. But the two are not interchangeable. It is usually safe to use an outdoor lighting fixture indoors. However, most indoor lighting fixtures are not suitable or safe for outdoor use. The best way to tell if a light fixture or bulb is safe to use outdoors is by checking its UL rating. So proceed with caution if you plan to use indoor lighting fixtures outdoors, as most indoor fixtures are for indoor use only. When you go looking for lamps (that technical term for bulbs) and lighting fixtures, look for a UL listing or rating. UL (formerly Underwriters Laboratory) is a testing and certification agency that certifies lamps and fixtures among many other industrial and commercially available products. A UL listing or similar certification is required by law for many products. There are several grades of UL ratings that help indicate the proper setting and use of an electrical component. When used according to the appropriate UL rating, electrical products should be safe to use and operate. However, using an electrical component in a way that is outside of its UL rating can cause the component to fail. It may also create a fire or other safety hazard. The most basic UL certification is “UL Listed for Dry Locations”. Often this is listed on packaging simply as “UL Listed”. These items are safe to use indoors. However, they should not be exposed to any type of moisture. This is the ideal listing for dry areas of the home such as living rooms, kitchens, bedrooms, and any other area that is not exposed to the elements and is not normally subject to excessive humidity or condensation. A lamp or fixture that is UL Listed for Dry Locations should never be used in a damp or wet location. Using a lamp or fixture listed for dry locations outdoors could cause a lamp to fail. When exposed to the elements, these lamps and fixtures are not built to be watertight or even water resistant. The introduction of water can cause the lamp to malfunction. The most benign malfunction would be for the lamp to simply stop working. However, there is a greater danger. A lamp or fixture listed for dry locations that is used outdoors can become a fire hazard. When exposed to the elements, water can get into the fixture and ultimately into the lamp, causing leakage current. Leakage current occurs because water conducts electricity. When water comes in contact with electrical components, the current runs from the exposed electrical components through the water. The current running through the water can create heat or cause arcing, which can ignite combustible materials. This kind of electrical fire is a common cause of house fires. Items that are UL Listed for Damp Locations are made to stand up to slightly more moisture than dry listed items. In the case of lamps and fixtures, this means that they are somewhat more watertight, though not completely. For this reason, a UL certified lamp or fixture that is suitable for damp conditions still cannot be used where it is exposed to the elements. The main function of lamps and fixtures listed for damp locations is for areas that don’t receive direct contact from water but are still subject to significant condensation. Indoors examples of this kind of use include bathrooms, indoor pools, and utility rooms. All of these areas commonly have enough moisture in the air to cause water to condense and bead up on electrical components. Outdoor examples of “damp locations” include any outdoor area that is completely protected from the elements. This may be a covered porch or patio. The area needs to be so well covered that even in a storm it will not come in direct contact with water or any precipitation. For an area that will get even a little rain during a storm, a higher UL listing is necessary. Items UL listed for damp locations can withstand a small amount of moisture safely. They are built to keep water out and avoid the danger of electrical fires when used properly. This UL listing is the only listing that indicates a lamp or fixture is completely safe for outdoor use. If you have an area that will receive any amount of direct moisture, this listing is absolutely necessary. This includes any area where water will drip, splash, or flow against the electrical components. The nice thing about this listing is that it really can be used almost anywhere outdoors. 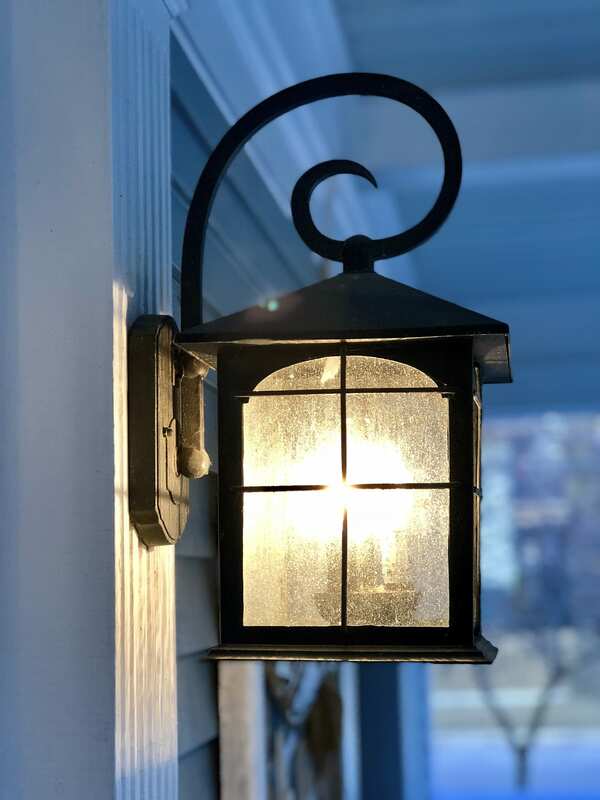 Examples of outdoor uses include open decks, porches, and patios, as well as every type of decorative outdoor lighting. Wash lights for the facade of your home, bullet lights that highlight special features, and path lighting along a walkway all need this listing without exception. Besides the UL listings for safety around water, another concern is the temperature that the light will be used in. Typically, indoor lights will be exposed to a limited temperature range. The light will not be used in very cold or very hot temperatures. However, an outdoor lamp or fixture will be exposed to a much broader range of temperatures. Outdoor lights that will be used in extremely cold conditions may require special consideration. In the winter, even here in Georgia, temperatures can easily drop below freezing. This can cause problems with fluorescent lights especially. That includes the popular spiral CFL bulbs. While CFL bulbs are a great way to save on electricity, they can start up slowly or flicker in extreme cold. These issues can start when the temperature drops below freezing, 32 degrees Fahrenheit. There are many newer bulbs that are built to withstand cold, but make sure you check the packaging to be sure. LEDs are great in the cold. In fact, cold weather makes LEDs more efficient and brighter. On the other hand, heat is the enemy of LED lamps. LED lamps can generate heat in their base and require airflow to stay cool. Many outdoor wet listed fixtures are tightly enclosed to withstand water. That can be a problem for LEDs. Especially in the hot Georgia summers, overheating can cause an LED to be less efficient and burn out faster. The professionals at Night Vision Outdoor lighting are happy to discuss your options. We can make sure that the fixtures you are using will not adversely affect your LED bulbs. In some cases, you may want to use an outdoor lighting fixture indoors. This can be a unique design choice for any room. In particular, you may want to use hanging outdoor fixtures to bring a unique look to an indoor dining room. Or you may just like the look of an outdoor sconce to use in any part of your home. The good news is that there is absolutely nothing wrong with using an outdoor lighting indoors. If a lamp or fixture can withstand the elements outdoors, it can definitely be used safely indoors. If you are going to use a fixture underwater, such as in a swimming pool or water feature, you will need an aquatic light. Even lights UL listed for wet conditions are not fully waterproof. Lights submerged in water can be a great way to highlight a water feature. Even a little bit of light can illuminate a fountain or small pond. Some homeowners choose colored lights for a special effect. However, any light that will be completely submerged in water must be built specifically for that purpose. Night Vision Outdoor Lighting is happy to work with you to create the perfect lighting for your water feature. If you are ready to get your outdoor lighting project started, you can contact us online or give us call at 678-828-2999. We return most calls in a day or two, and often on the same day. After that first call, we’ll get one of our experts out to your home in about three business days to talk about your priorities, design preferences, and budget. From there, we will work with you to build an outdoor lighting system that will make your home shine!